Choosing the right pressure washer for your needs and your budget is oftentimes confusing and difficult. A pressure washer with Honda engine parts is one that you may want to consider, but you need to keep in mind that a Honda pressure washer may not necessarily have the Honda name on it, because some just have a Honda engine. The features and qualities of a Honda pressure washer help this brand to move to the forefront of your list of choices. By learning more about the Honda powered pressure washer and other brands of pressure washers, you will be able to determine the right one for you, your business, and your particular needs. Honda pressure washers are known for their high-quality engine construction. This quality ensures that you will have a pressure washer engine that will last you through many years and uses. It gives added value to your initial investment when you purchase a quality product that lasts and lasts. Honda is known in the car world as creating quality engines that last and last, and their name is no different in the pressure washer world with their Honda small engine parts. Many companies have chosen to use the Honda engine in their pressure washers, including the ones offered at Ultimate Washer. Honda pressure washers are known for their quiet and reliable engines. Pressure washers can be quite loud and choosing one on the quiet end of the noise spectrum can make using the power washer to wash your home, car, boat, and other vehicles less noisy and obtrusive. This is great if you want to pressure wash your home or vehicle during the early mornings or in the evenings, because you will not have to worry about bothering your neighbours with the noise. Pressure washing is necessary when you are getting ready to paint a home or when you have dried on dirt or mud on your automobile, ATV, or other vehicle. Honda pressure washers are durable and powerful enough to do the job right and efficiently, so that you can make the most of your time. These pressure washers come with an 11-13 horsepower engine that can create as much as 4,000 PSI (pounds per square inch) to allow you to get the power that you need for your particular use. This can make the process take less time, because you have the power to do the job efficiently. Honda pressure washers are also a great choice for sidewalks, porches, and decks. The fact that they are portable with their 10-inch tubed pneumatic wheels can help you to move the pressure washer around to where you need it. This is a great benefit if you need to use it in the front and back of the house, because these pressure washers are normally a little heavy and large to simply pick up and move. The wheels will allow you to wheel it around to where you need it. 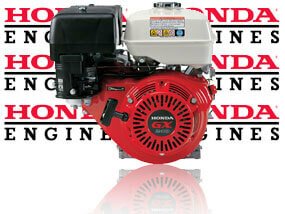 If you need a pressure washer, with the reliability of GX engine parts then consider a Honda pressure washer. With the high quality engine, reliability that you can count on, and a quiet engine that will not irritate the neighbors, a Honda pressure washer will help to make your pressure washing less stressful and more efficient.